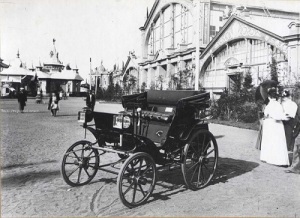 Its creators, Eugene Yakovlev and Pyotr Freze, partnered after seeing the German Benz car at the World Exhibition in Chicago in 1893. Mr. Yakovlev, a retired Navy lieutenant, had been working on his own model of the internal combustion engine and held multiple patents for kerosene and gas-powered engines; Mr. Freze was an engineer who also owned a carriage-building business. Incidentally, during his illustrious Navy career, Mr. Yakovlev served aboard the American steamer Yazoo. He also served on a German steamship that sailed the Baltic Sea. His experiments on internal combustion began with attempts to adapt the engine invented by the German engineer Nicolaus Otto to liquid fuel -- unsuccessfully. In 1889, Mr. Yakovlev successfully manufactured and sold an engine of his own construction. The Russian Exploration Society had been watching his efforts with great interest, and invited him to make a presentation at its annual congress -- this also contributed to Yakovlev's success. An endorsement from Dmitry Mendeleev himself, an ultimate authority in Russian science and engineering, crowned Yakovlev as one of the nation's stars. The first Russian car, a product of the Freze-Yakovlev partnership, was equipped with a single horizontal cylinder that was located at the back of the vehicle and produced up to 2 horse powers. The ignition was electric, generated from an innovative dry-element battery and a patented spark plug. The automobile seated two, had two brakes and could travel at the speed of up to 13 mph. Emperor Nicholas II, when he visited the exhibition, did not find the invention particularly appealing, but the lack of imperial endorsement did not prevent Yakovlev and Freze from launching an advertising campaign and continuing to develop their invention. Their partnership ended when Mr. Yakovlev died unexpectedly, at the age of 41, and his engine factory changed hands.